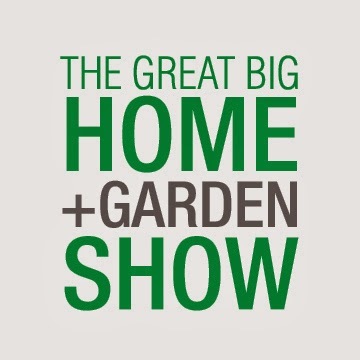 The 2014 Great Big Home & Garden Show is hitting the IX Center from February 8th - 16th, bringing you over 600 exhibitors, demonstrations, celebrity performances, and more. I have attended the show the last couple of years, and it's always a great way to spend the day. "R" and I enjoy working on our home, both inside and out. Okay, well I do, and "R" begrudgingly accommodates most of my requests. In the six years that we've been living together, we've made over every room in the house with the exception of our master bedroom/home office space upstairs. This included gutting the one and only bathroom in our house, painting every single room, and a complete kitchen remodel (which I still need to share pictures of with you). A show like this one is a great place to get ideas, meet vendors, and sample products. I also always enjoy catching some celebrity and local chefs doing demonstrations at the Main Stage and Cooking Stage. The Loretta Paganini School of Cooking will be joining The Great Big Home & Garden Show by hosting a variety of local culinary experts with themed demos taking place daily. You can purchase tickets in advance online for $11 per adult ($3 savings for purchasing online), $5 for children 6-12, and under 6 are free to attend. My readers can save an additional $1 off each ticket by using BITEBUFF as a code during checkout. Or, you can win two admission passes this week! Just leave me a comment below, telling me which room in your house or outdoor space, that needs some upgrading. For us, it's the sun room right now. Some structural work that needs to be done may lead to a redesign, so I'm looking for some inspiration at the show. Also, where do you like to shop for home goods? I'm addicted to Marshall's and TJMaxx. I think it's the thrill of the "hunt" that excites me. Most of our home is decorated with their wares. I will select a winner, using random.org, on Friday, January 31st. Good luck! Disclosure: The Great Big Home & Garden Show offered me two media passes and two admission passes for a giveaway in exchange for this post. All opinions are 100% my own. A picture is worth a thousand words, and I just couldn't stop snapping. Located in Old Brooklyn on State Road, we had literally driven by this restaurant on a weekly basis and had no idea that it existed. The Café Miami signage is a little hidden by the awnings, and there is a giant mural on the side of the building next to it that is very distracting. Our focus was always elsewhere, and we totally missed this. As soon as I entered, I couldn't wipe the grin from my face. It had such character, and there was so much to look at. The owner/cook, Larry, is a collector, and everything in the restaurant is for sale. This guy kept us company from the plant next to our table. The dining room was small and charming, and there is also limited seating at a counter when you enter the restaurant. That would provide you with a front-row seat to the banter from the kitchen, which sounded entertaining at times. As soon as we were seated, two homemade chocolate cupcakes arrived at the table, compliments of the cook. "R" was not complaining about the sweet start to the morning. We both ordered omelets. I went with the Cheese Lover ($5.50). Dining Deals Alert! It came with a side of toast and hashbrowns. I added a side of bacon for $3. The menu isn't large, and the item descriptions are pretty vague. We overheard a server talking to another table about a cornbread waffle with sausage gravy. Umm, if that exists..."R" wants it! My omelet was okay. The cheese was clearly just American. It was also melted inside, but the slices on top left a slimy texture in my mouth that can only come from processed cheese. I could have done without the top layer, and it probably would have been a darn good omelet. The restaurant was a hoot, and I just pretended that I didn't see someone else's breakfast leftover on my cloth placemat. Our server, Crystal, was attentive and pleasant, giving us some history on the place. For the entertainment factor alone, she got a good tip that day. I think we'll be back. Happy New Year! Another year has passed, and we're starting fresh again in 2014. Reflecting back on the year, I had some great dining adventures. Many, thanks to you. The 2013 "To Dine" list of 10 restaurants that you all submitted was a good one. I knocked five off right away, tackled a couple of more as the months went on, and found myself left with three by December. I crammed them in, and the last 2013 posts will be coming shortly. Some favorites from last year's list were: Jezebels Bayou, Blue Door Café, Sterle's, and Miega. Over the next twelve months, I'll visit each of these restaurants and share my experiences with you. Anyone want to join me for one? I hope that you celebrated the ending of 2013, and beginning of 2014, well last night. Time certainly does fly by, and I try to stop and appreciate what I have in my life and what has transpired over the last twelve months. 2013 was a good ride, but I think that 2014 will be even better.